Have you heard of your temporomandibular joint (TMJ)? It’s one of the most used joints in your body. Did you know physiotherapy can help with TMJ problems? Your TMJ, also known as your jaw joint, is used for eating, talking, expressing emotion (both consciously and unconsciously) and breathing. Pain associated with dysfunction in this area may be felt in the jaw line, cheek, ear, temporal region (side of head) and commonly associated with headaches and neck pain. TMJ problems, or TMJ dysfunction (TMD) can also present as inability to fully open your mouth, pain with chewing, popping/cracking with opening and closing your mouth, and/or grinding/clenching of teeth. Some of the causes of TMJ problems can be derangement or displacement of a disc between your mandible (jaw bone) and skull, muscle dysfunction, habitual clenching/grinding (bruxism), or trauma to the face and jaw. Common contributing factors to TMD can be stress, anxiety, prolonged opening of the mouth (e.g. during dental procedures), mandibular malalignment or orthodontic work to name a few. A physiotherapist will assess the TMJ by asking a detailed history, taking observations of jaw alignment, posture, and neck position. They will observe how the individual opens and closes their mouth, looking for abnormal movements patterns, and observe for clicking from the TMJ. The therapist will palpate externally for muscle tone, and to assess the movement of the TMJ. Using gloves an intra-oral assessment will be completed as well to determine how the joint is functioning, and to further assess the myofascial system. The neck is generally assessed as it can commonly contribute to dysfunction in the TMJ. Following an assessment, a treatment plan and home program will be developed. Ms. W comes in with complaints of pain through the right greater than left temporal region of her jaw, inner ear on right, frequent headaches and stiffness in the jaw that is often worse in the morning. Recently she has begun to noticing a clicking from her right jaw, especially when she yawns or eats chewier items. Her dentist advised her she likely has TMJ problems and recommended that physiotherapy may help. The physiotherapist may ask a few of the following questions: How long have you been dealing with this problem? Do you ever find yourself clenching your jaw in times of stress or have you been told you grind your teeth overnight? Any recent dental procedures? Any history of trauma to the face or neck? As mentioned above the TMJ is one of the most frequently used joints in the body. Most clients who receive treatment for their jaws have been experiencing symptoms for some time, and often did not know that physiotherapy can help. Commonly they have seen their doctor or dentist prior to seeking treatment. In the case above the individual likely has a longer standing history of clenching, also known as bruxism. Commonly people can do this subconsciously during their sleep, or in times of stress. When frequently clenching the muscles of the face and jaw can become fatigued and become sources of pain. 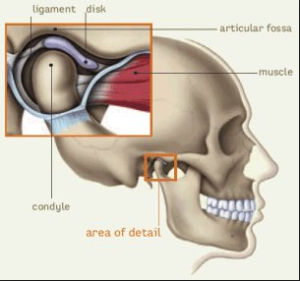 When muscle are held tight for long enough they can start to alter the way the jaw moves, and lead to problems with a disc located between the jaw and the skull. The physiotherapist will develop a treatment plan specific to Ms. W’s presentation completing treatment specific to the muscles surrounding the TMJ and the joint itself. If any of the symptoms described sound familiar, book in for an assessment today! https://www.warmanphysio.com/wp-content/uploads/2017/04/TMJ.png 254 298 Haylie Lashta https://www.warmanphysio.com/wp-content/uploads/2016/05/warmanphysio-300x110.png Haylie Lashta2017-07-27 06:58:462018-11-08 14:58:19Do YOU have TMJ? Welcoming incoming therapist Kendra Usunier! As many of you know I, Haylie Lashta, will be going on maternity leave soon, with my last day scheduling clients being June 2, 2017. I have searched for the perfect person to come in to cover for my maternity leave that can also complete women’s health assessment and treatment, and she has been found! Kendra Usunier BMR(PT), MClSc, FCAMPT will be joining our team starting on May 23, 2017! 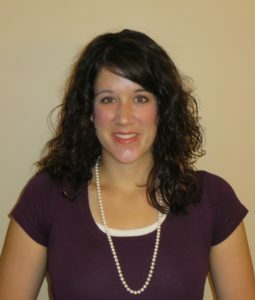 Kendra graduated from the University of Manitoba in 2008 with a Bachelors of Medical Rehabilitation in Physiotherapy. She went on to complete a Masters of Clinical Science in Manipulative Therapy from Western University in 2015. Since graduating Kendra has worked in Saskatchewan and Manitoba. She returned to Saskatoon in 2012, and is excited to begin working in Warman. Having grown up in a smaller community, she is happy to return to that environment. Kendra’s primary focus has been orthopaedics and women’s health. She has taken extensive additional training in orthopaedics, becoming a Fellow of the Canadian Academy of Manipulative Physiotherapy (FCAMPT) – an internationally recognized qualification in manual and manipulative therapy. 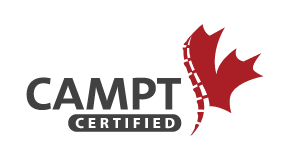 For more information on CAMPT therapists please click here. In addition to orthopaedics, Kendra has a passion for women’s health and pre-and post-natal care. She has also taken additional courses in treatment of temporomandibular joint dysfunction, acupuncture, pain management, and myofascial release. Kendra has a passion for ongoing education in physiotherapy, striving to provide the most up to date, evidence based treatment for patients. She assists in instructing muskuloskeletal courses at the University of Saskatchewan and within the Canadian Orthopaedic Division Syllabus. Kendra enjoys spending time with her husband and daughter, running, playing soccer and doing yoga in her spare time. Kendra’s schedule has been provided and is available for appointments. Contact us to book your appointment today! Don’t want to wait? Cole Digel has availability as early as the week of May 15, 2017.
https://www.warmanphysio.com/wp-content/uploads/2016/05/warmanphysio.png 287 780 Haylie Lashta https://www.warmanphysio.com/wp-content/uploads/2016/05/warmanphysio-300x110.png Haylie Lashta2017-05-15 20:19:132018-11-08 14:58:20Welcoming incoming therapist Kendra Usunier! Is your NECK causing your arm or shoulder Pain? Case Study: A client HD came to the clinic after several weeks of shoulder, shoulder blade and arm pain. This pain started in the shoulder and moved down the arm. The client would describe the pain as ‘sharp’, ‘burning’, ‘shooting’, ‘deep achy’, and ‘pins and needles’ depending on what they did. Initially their pain would come and go, but over time the pain would stay for longer periods of time. This client found that sometimes anti-inflammatory medication and massage helped, but it always came back. Since their pain started in their shoulder it was believed that it was a shoulder injury (rotator cuff). After assessment by a physiotherapist it was identified that HD had issues from the neck resulting in shoulder and arm pain. With treatment including home exercises, stretches and programming, the client was able to return to full function and a pain-free state of being! The story of HD is not uncommon. Often people are not sure where to go for a variety of issues and complaints. Your local Warman Physio is able to provide assessment and treatment of any ache or pain occurring within the body, whether it was caused by an injury or ‘just showed up’ one day. Physiotherapists are trained to provide assessment and treatment of all the body systems including the muscles, tendons, ligaments, and nervous system to identify what is causing any pain or issue. 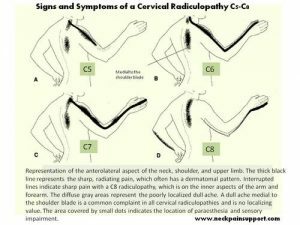 How does the neck cause pain in the shoulder and arm? The body is a complicated group of systems that work together to allow us to complete our everyday tasks. Our neck has 7 vertebra (C1-C7) that go from the base of the head to the base of the neck. Within your neck there are 2 joints at the top and bottom of each vertebra, and most of them are separated by small discs. Our spinal cord is enclosed inside a tunnel within the vertebra. The nerves that go down into the shoulder and arm come out from between the vertebra, through the muscles and down the arm. These nerves then control the muscles (creating movement) as well as sensation (touch, temperature, etc). If something happens to the nerve throughout it’s path down into the arm it can create issues in the movement, sensation, or both!Sometimes it is hard to figure out where pain is coming from – the muscles, joints, nerves, tendons (attach muscle to bone) or ligaments (attach bone to bone). Leave the guess work out of your pain and have it assessed by your local Warman Physio! We currently have appointments within 0-2 business days and have accommodating hours for early morning (8 am) and after work (until 8). https://www.warmanphysio.com/wp-content/uploads/2016/05/13235441_1087731991272760_3289049059303575252_o.jpg 1366 2048 Haylie Lashta https://www.warmanphysio.com/wp-content/uploads/2016/05/warmanphysio-300x110.png Haylie Lashta2017-01-19 16:03:192018-11-08 14:58:21Is your NECK causing your arm or shoulder Pain?